We diagnose and manage allergy, asthma, and immunologic disorders. Our physicians are board certified by the American Board of Allergy & Immunology. 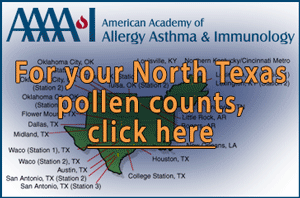 Welcome to Dallas Allergy & Asthma Center (DAAC)! Our office is located in North Dallas and has been serving patients in the North Texas area for over 30 years. Our physicians are board certified by the American Board of Allergy & Immunology and are actively involved in the teaching and training of medical students and residents, holding faculty positions at the University of Texas Southwestern Medical School, as well as working in the Parkland allergy and asthma clinics. Our Mission: The physicians and staff at DAAC are dedicated to serving adults and children with allergy and asthma problems through careful and efficient care, taking into consideration the patient's physical needs and emotional well-being. We attempt to see that each patient receives the attention necessary to solve his or her immediate and long range allergy problems. We provide this care in a pleasant, professional and caring environment. It is important to us that our patients' needs are met. Our goal is to provide compassionate, quality medical care in a professional atmosphere. Our staff is comprised of highly trained individuals, dedicated to making our patients' visits as pleasant as possible. Spring allergies will be here soon. Symptoms include sneezing, stuffy or runny nose, itchy nose, eyes or roof of the mouth. Many people with untreated allergy symptoms are not aware of how much better they can feel once their symptoms are properly diagnosed and managed. Our board certified allergists would be happy to help you come up with the treatment regimen that works for you this spring. There are some allergy medications that you can take to control your symptoms so that you can still go out and enjoy the weather in the spring. Remember to use your saline nasal spray after your outdoor bike rides or runs to wash all of the pollens out of your nose. With spring in the air, tree and later grass pollens will be flying everywhere. Aside from taking your allergy medications, reducing your exposure to these pollens is also very effective at reducing your symptoms. Keeping your house and car windows closed, and limiting your outdoor activities on high pollen count days will help to reduce your exposure. If you are participating in outdoor activities, try to change your clothes and/or shower immediately after the activity to wash the pollens away. Saline nasal sprays can also be helpful to wash away the pollens that you breathed in through your nose. 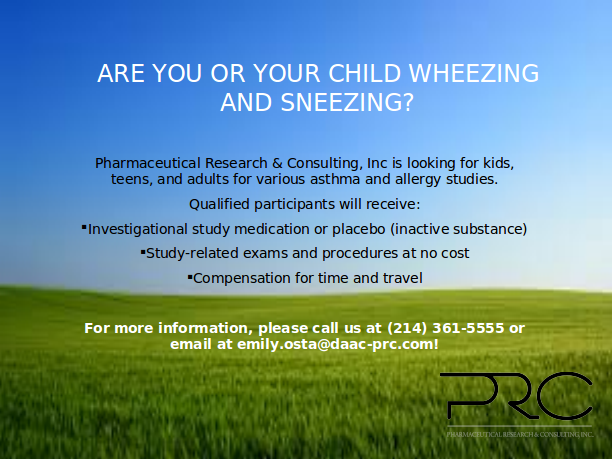 We are always looking for possible participants in various asthma and allergy studies. If interested, please contact our office today to see if you might qualify for an ongoing study! Also, if you know of someone who may be interested in participating, please refer them to us—if they qualify and enroll in one of our studies, you will receive a $50 gift card as a “thank you” for the referral. View recent levels of pollens in your area. Reports are available for the last two years.